Silva Non-Skid Solutions (SNSS) is the manufacturer of Silvagrip®, an incredible new technology that provides a non-skid surface for demanding offshore and marine environments. Silvagrip replaces traditional non-skid paint, as used by the US Navy and is approved under MIL PRF 24667-XI. With an expected service life of up to twelve years, Silvagrip is waterproof, corrosion-proof, UV-proof and resistant to oil, chemicals and temperatures up to 400°F. Its extended life means cost savings in labour and replacement materials, compared with other non-skid products. Unaffected by sun, salt and water, Silvagrip non-skid tape has a rockwell hardness of Rc60+ and bond strength of 2,500psi . SNSS’s Silvagrip solution is designed for demanding, heavy industrial applications such as drilling rig platforms. Silvagrip provides a high-traction work surface for critical areas and walkways, and will maintain that grip surface under adverse environmental conditions. Silvagrip is a suface-engineered, aluminum-based alloy non-skid tape with ceramic abrasives, which are encapsulated by molten aluminum and permanently solidified into position and designed for superior durability. When the molten metal alloy is atomized, it hardens and leaves a durable surface with each particle, resulting in a random structure. The ceramic particles held in the alloy have a similar hardness level to diamonds and the random structure produces an excellent non-skid profile, preventing slips with impressive wear-resistance. Silvagrip doesn’t require professional installation and, as it is ready for immediate use after application, there is no downtime from fumes or curing time. It doesn’t need expensive contractors or tools to put on and its flexibility makes it ideal for uneven surfaces found on offshore rigs. Silvagrip comes in convenient pre-cut sizes in both sheets and rolls for easy handling, installation and replacement. The material can be easily cropped according to the size requirements or from a CAD drawing from the client. If there is a damaged area, it can be simply removed and replaced. The initial cost for Silvagrip is higher than traditional non-skid applications, but the total cost of ownership (TCO) is much lower in terms of the alternatives. Silvagrip’s TCO over its useful life will be only 30%-50% of other non skid options, including both paint and other peel-and-stick products. 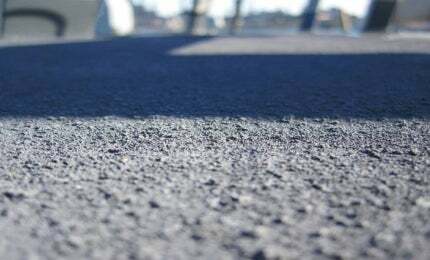 The key advantage of a peel-and-stick non-skid product over traditional epoxy non-skid surfacing is that it has none of the associated costs and constraints with applying or removing the damaged areas. Silvagrip eliminates between six and ten replacements of any other non-skid product over its lifetime, making it a more economical solution for the client. Silva Non Skid Solutions (SNSS) manufactures “Silvagrip®” a patent-pending, aluminium ceramic, non-skid, peel and stick, QPL Approved. Increase safety. Eliminate hassles. Save money. Silva Non-Skid Solutions has received QPL approval from the US Navy. Silva Non Skid Solutions (SNSS) manufactures Silvagrip®, an aluminum ceramic non-skid peel and stick. Silva Non Skid Solutions (SNSS) manufactures 'Silvagrip', an aluminum, ceramic, non-skid peel and stick solution.